This chapter introduces important concepts such as smart cities, innovation, technologies, and “smartness” in government. It argues that a concept of smart city should be more than the use of information technologies in local governments. The study and analysis of cities today requires a multidimensional and multifaceted concept and, therefore, multiple components. Some of these components are (1) public services, (2) city administration and management, (3) policies and other institutional arrangements, (4) governance and collaboration, (5) human capital and creativity, (6) knowledge economy and pro-business environment, (7) built environment and city infrastructure, (8) natural environment and ecological sustainability, (9) ICT and other technologies, and (10) data and information. 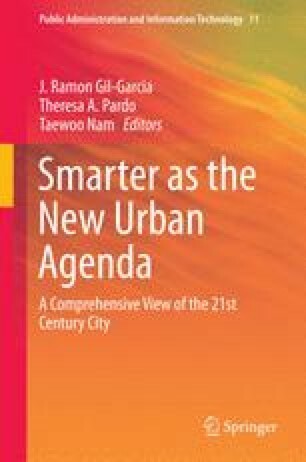 In addition, the authors refer to smartness as public sector innovation in urban contexts. A comprehensive view of a smart city should encompass government innovation in management and policy as well as technology and must acknowledge how the context of a city shapes the data and the technological, organizational, and policy aspects of a specific initiative. The chapter also briefly describes the content and the target audience of this book. Hase, J. (2014). Smart city integration: Why open IT architectures are key (industry perspective). Deutsche Telekom, Government Technology. http://www.govtech.com/data/Smart-City-integration-Why-open-IT-architectures-are-key.html Accessed 10 Oct 2014. Marshall, A. (2014). Are cities losing control over ‘smart’ initiatives? (opinion), Government Technology, published March 4, 2014. http://www.govtech.com/data/Are-Cities-Losing-Control-Over-Smart-Initiatives-Opinion.html Accessed 10 Oct 2014. Newcombe, T. (2014). Can we trust smart cities? Government Technology, published June 2. http://www.govtech.com/data/Can-We-Trust-Smart-Cities.html?utm_source=related&utm_medium=direct&utm_campaign=Can-We-Trust-Smart-Cities. Accessed 10 Oct 2014. Scholl, H. J., & Scholl, M. C. (2014). Smart governance: A roadmap for research and practice. iConference 2014 (pp. 163–176). http://dx.doi.org/10.9776/14060.